Every day, in a cavernous facility on the south ramp of O'Hare Airport, agents for United States Customs and Border Protection examine thousands of pieces of mail arriving from overseas. Every parcel is x-rayed, the officers on the lookout for contraband ranging from knock-off wristwatches, to counterfeit Viagra, even currency. Among the items they find every day: synthetic marijuana. More than heroin or cocaine, it has rapidly become one of the most frequently-seized illicit drugs arriving on U.S. shores. "This stuff is extremely dangerous," says the agency's Brian Bell. "It's untested. You're basically ingesting something that, nobody knows what it's going to do to you." Synthetic pot doesn't look like pot at all. In its raw form, it comes shipped as a white powder, usually marked on manifests as a legitimate chemical. Almost all of it comes from China. Typically, the end-users of the drug dissolve it in acetone, then spray the solution on some kind of plant material. Until recently, it was sold in the open, in stores like truck stops, smoke shops, and gas stations, under names like K2 or Spice. But after its appearance in the U.S. seven years ago, hospitals and poison control centers saw an alarming spike in cases which they at first found hard to identify. "It was actually Customs and Border Protection which first identified it coming into the country," Bell said, noting that an agricultural specialist in Ohio became curious, about why so many "herbal incense" packets were showing up in shipments. That officer, working with a chemist in Chicago, was the first to identify the chemicals lacing synthetic marijuana, in 2007. But as fast as the Drug Enforcement Administration could get those compounds assigned to the Schedule-1 list of illicit drugs, the makers in China would manipulate the formulas to create so-called analogues which were suddenly legal again. Health Experts Warn Against "Fake Pot"
"I mean, it's literally moving one little bar on the molecule," Bell said. "You're talking about chemists and scientists. And we've got our chemists and scientists combating them." One of those Customs chemists, Neele Shepard, makes the trip to O'Hare regularly, to test the samples seized by officers manning the x-rays. "Every time we try to control a particular substance, they redesign it," she said. "And all of a sudden, it's a new substance that's not controlled." On one recent day at O'Hare, Shepard tore into boxes manifested from China and Hong Kong, placing tiny samples on her testing equipment, and watching as the computer told her what was in each box. It didn't take long, for the first sample of synthetic pot to pop up. "This one's AKB-48," she said, pointing to the peaks and valleys on the graph, identifying the white powder she had just tested as a so-called "cannabanoid" which is illegal in the United States. "Particularly through our mail facilities, the bulk chemical is coming in." Shannon Sheehan knows about that chemical first hand. Suffering lingering pain from a broken hip, her mother bought a packet of synthetic pot, branded "Stoopid", in the fall of 2011. Her body was found in her Marseilles home. Sheehan said the rooms looked like they had been ransacked, and that her mother died from a massive head injury. "Such a great woman," she said. "And she was my best friend for all my life." Through tears, Sheehan described how her mother believed the drug was safe because it was being sold legally and openly. And after her mother's death, she said she found few authorities interested in pursuing the case as more than a tragic accident. "The cops didn't do nothing," she said. "I proved to them it was illegal." 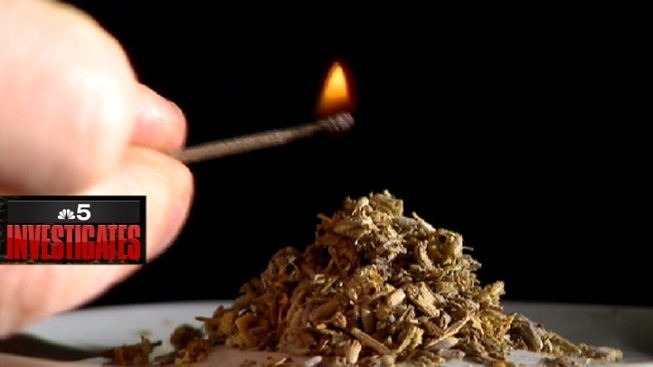 Illinois has been credited with putting one of the strongest synthetic pot laws on the books. Since the law went into effect three years ago, cases in emergency rooms have dropped drastically, from a high of 368 statewide in 2011, to fewer than 60 last year. But as similar laws are passed in other states, pushing the packets of bogus pot out of the stores, new markets have sprung up on line. Most bill their wares as "100% legal". Many even take credit cards. Sheehan for one, cautions that parents should especially be concerned, and wary of their children express interest in a product which they might believe is safe, because it is being sold so openly. "Don't underestimate it," she said. I would seriously compel any parent to seek help, to seek information. And don't waste a day!"